My movie minutes: Tamil Films on Men, with Two Women Syndrome. Tamil Films on Men, with Two Women Syndrome. Women play an important place in the lives of men both in real life and in the world of Cinema. After all, cinematic presentation of events and characters has a lot to do with real life. It is the generational perspectives that pointedly give a new dimension to reflection of attitudes and behaviour both in real life and in their portrayal, on the big screen. Owing to the course of circumstances or due to the vagaries of men,at times, two women cross the lives of men either simultaneously or as uncommon intrusions, either before or after one's marriage. Though in modern times parental role in Children's marriages is getting a newer dimension as facilitators,in the past the participation of parents in getting their wards married off,remained as one of the most vital responsibilities.Love marriages were not common events and even in such cases the difficulties in convincing the parents were too many.Richer parents playing foul in separating lovers could not be ruled out.There were communal factors in quelling the spirit of romance and even now we come across honour killings in the name of one's caste.In the midst of these realities does exist, the predicament of two women crossing the life of a man. Among the most popular heroes of the last century.MGR cautiously avoided such story lines.Any of his movies with two heroines will have him either playing a dual role, or two women loving him and he choosing to go with one of them.This is how one of the two women characters in films like Parakkum Paavai,Thozhilaali, Kannan En Kadhalan,and Naan Yein Pirandhein would silently suffer the pang of not getting him.The image-conscious hero carefully avoided sailing between two shores. The most frequent delineation of this two women syndrome would be the outcome of either parental interference or circumstantial negative impact,on the lovers,leading to the occurrence of the hero marrying some other woman and the former woman stepping into his routine quite unexpectedly. The sudden reappearance of the former woman would throw a lot of emotional turmoil into the hero's family routine, in many an unwelcome dimension.This is how the two magnificent films Iru Malargal and Iru Kodugal, came as mind blowing experiences fort the viewers.In both the films it is the paternal heads who make their sons marry another woman through a course of emotional blackmail. The former was a grand Sivaji Ganesan show brilliantly told by veteran director A.C.Thirulok chandar.It was Padmini who as the pathetic lover of the hero, created an emotional storm in Iru Malargal. Sivaji Ganesan as the helpless victim of the manipulative circumstances, displayed a fabulous demonstration of concern for his former lover and deep love for his wife and daughter.His emotional sufferings and the pitiable position of the two women that he had to handle delicately,were poignantly portrayed on the big screen.K.R,Vijaya as the hero's wife was an embodiment of feminine grace and dignity.Even today the audience would be carrying disturbing memories of those anguished moments of screen watch. The latter was a Gemini Ganesan film adeptly and admirably narrated under the exemplary direction of K.Balachander.Gemini Ganesan well known for his subdued role performance made his character unenviable by his soft underplay of emotions. Sowkar Janaki as Gemini Ganesan's former woman, was a grand combination of conflicting emotions, such as the pride of the neglected woman coming up in life, with legitimate anger and fury against the man who failed to protect her, and her sympathy for her lover and his family with utmost feminine grace and compassion. It was really exciting to watch Sowkar Janaki,as district collector and Gemini Ganesan as the office superintendent at the collectorate,discussing heatedly, the loss of a file and the loss of Janaki's life at one stretch. Jeyanthi as the wife of the hero, delivered her role as the helpless home maker in an inimitable grumbling style.Every scene was well made and even now it would be a great pleasure to recall the stupendous moments of watching the film in a mood of total absorption. 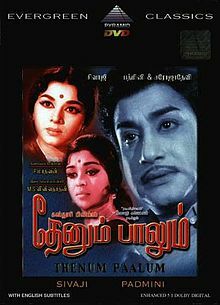 There were the other two Sivaji Ganesan films Paalum Pazhamum and Uyarndha Manidhan and Gemini Ganesan's Paarthaal Pasitheerum[shared as second hero with Sivaji Ganesan as main hero] which showed them marrying another woman either after seeing the death of the lover as in Uyarndha Manidhan or under the presumption, that their first wife is no more as in the other two films. Paalum Pazhamum had Sivaji Ganesan donning the role of a doctor working on a cure for tuber- culosis, with a nurse who later becomes his wife and gets affected by the very same disease.As she does not want to trouble her husband with her disease she disappears from his life.The doctor becomes depressed and after pressures from his family, agrees to marry his uncle's daughter.The hero also turns blind in a chemical explosion ,during the course of his research. Meanwhile his wife reappears and what follows adds up to the conflicting moments.B.Sarojadevi exquisitely played the role of the nurse and the hero's wife and Sowkar Janaki was compact in the role of the hero's marriageable cousin. Paarthaal Pasitheerum presented beautifully, the entanglement of the hero in not being able to disclose to his second wife, the fact that his first wife who was believed to be dead had come back alive but in a stat of blindness.Gemini Ganesan was a perfect bet for the powerful character fitting into its groove as naturally as possible. Where as Uyarndha Manidhan showed Sivaji Ganesan at the most powerful delivery point, entangled with the complexity of his son born of his association with his late lover, knocking at his doors years later.The son knew his father but the latter did not know him as his son.The dramatic events that followed were an emotional package beautifully delivered by the hero and his childless wife finally taking the youngster into their fold.Sivaji Ganesan,his charming lover Vanisri and the highly dignified and understanding wife Sowkar Janaki were all mightily carved characters making a mega impact on the screen, to last for a life time.Sivakumar as the orphaned son was just meek and lovely. All these films were magnificent revelations of how difficult it is for a man to undergo the trauma of the two women syndrome in their life. In this category there are two memorable films of Sivakumar narrating differently the tale of men living between two women.They are the humorously told 'Veetila Raman Veliyila Krishnan' and the most passionate Balachander film Sindhu Bhairavi.The first of the two released in 1983, was a freak kind of movie with vagaries taking the hero into an unusual experience of living with two women. The film directed by Manivannan had Radhika and Suhasini as the two women crossing the life of the hero.Manivannan did a similar kind of film with Mohan playing the lead and the film Gopurangal Saaivadhillai became a popular release of the Nineteen Eighties.In this film Mohan was not satisfied with the funny name of his wife called Arukkaani[neatly performed by Suhasini] and her rustic and shabby looks.Hence he went in search of a beautiful woman[[played by Radha]and the following incidents were an even mix up of humour and pathos.The film pointedly tried to establish the core values of life. Whereas K.Balachander's Sindhu Bhairavi was an epoch making film, with Sivakumar playing the role of a renowned Carnatic musician and his wife Sulakshana who had no interest or love for music proving to be a fiasco in his musical routine.The arrival of another woman [here again Suhasini]with a distinct flair for music, wins over both the ego and love of the exceptional singer.What follows in the life of the musician is the core of an aesthetic and emotional experience for the audience.Here was another film to add to the proud moments of K.Balachander as a film maker of very high quality.It also brought a lot of accolades for the meritorious performance of Sivakumar with absolute grace ,charm and spontaneity.Both the women characters impressed the audience thanks to the natural and involved performance of Sulakshana and Suhasini.The musically talented and well informed Suhasini's character and the profoundly family bound Sulakshana's role, were both the two grand models of aesthetic and ideal womanhood. There were a couple of films of the invincible film maker Balu Mahendra on this exceptional theme of double- women impact, on men's lives.This new wave director's narrative style was known for a charming element of aberration.Mohan's 'Rettaivaal Kuruvi'and Nizhalgal Ravi's 'Marubadiyum' are the two special Balu Mahendra films of this type.Rettaival Kuruvi was a catchy humomrous narration of how a man struggles to hide his extramarital relationship from his wife and manages his time between his second woman and his innocent wife. Archana an extraordinary, Balu Mahendra's well- groomed actress, beautifully performed the role of Mohan's wife.Radhika as Mohan's second wife, as usual delivered her brilliant performance effortlessly and created a special impact. Marubadiyum was altogether a very serious film depicting the vagaries of a film director for an actress possessively passionate about him.The movie also effectively portrayed the plight of the suppressed wife of the director and it was a cake walk for the highly talented Revadhi to play this role.Both these films of Balu Mahendra dealt with a similar theme in two different dimensions with events and developments not related to each other. The most recent films in this category were Parthiban Kanavu starring Srikanth and Snega and Sillunnu Oru Kadhal centering around Soorya,Bhoomika and Jyothika.The first film felicitously narrated the tale of a youth falling for a woman and marrying another woman looking similar to her.His marriage is under the assumption that he is marrying the very same woman whom he fell for.But when the truth unfolds, his happiness dies and interestingly he soon happens to meet the girl who pulled his imagination.The later developments and the traditional culmination of the story, called for a realization of what womanhood and marriage should actually mean for a man. The other film with rich aesthetic credentials presented the hero vigorously falling in love with his college mate Bhoomika and getting brutally separated by the girl's politician father,immediately after the hero tying the marriage knot at the Registrar office.After this the hero's marriage with another woman [Jyothika]and the latter's discovery of her husband's first love through her access to his diary forms the most fascinating side of narration.Besides,the wife's unique decision to bring her husband and his first woman together at least for a day turns futile.This rare attempt and its aftermath proved to be the crux of a new wave narration. The enigma of man-woman relationship is always an engrossing field for creative portrayal of stories and characters, through the medium of cinema.To deal with topics of one man living in between two women, becomes still more challenging for any film maker.For film makers of absolute psychological understanding of the intricacies of man woman relationship, stories of men with two women syndrome, takes one's imagination to exploring heights as to how individuals make their destiny and how destiny shapes the life of individuals.This is perhaps an endless zone for newer interpretations, in terms of the ever changing generational attitudes and perceptions. The Two Monumental Films of MGR.